Guest Blog: How Long Should Your Video Be? So, you know you want to make a video, which type of video you’ll make, and how you want to share it with the world. The big question is...what’s the perfect length for that video? 30 seconds? 60 seconds? 2 minutes? The exact answer is 75.3 seconds...ok not really. The truth is that it all depends...I know I know...another wishy-washy answer. But that’s because the length is determined by a variety of factors, since video can be used in a million ways. However, here are three quick tips to help you avoid saying too much or saying too little. First off, realize that all videos should help you accomplish one goal, not several. So, distill the mission of your video into one, short sentence. Keep that sentence top of mind when you’re crafting the script to make sure everything you say is moving you closer to accomplishing it - and do away with the extra fluff. But also, make sure you’re covering enough content to complete that goal. Secondly, identify a target audience...a VERY specific target audience. Don’t just appeal to “business people”, use as many adjectives and descriptors as you can to define them: like a job title, age range, maybe even give them a name. Once you know who they are, consider how much knowledge they have on your content already. This will help you determine how little, or much, educating or explaining you’ll need to do. 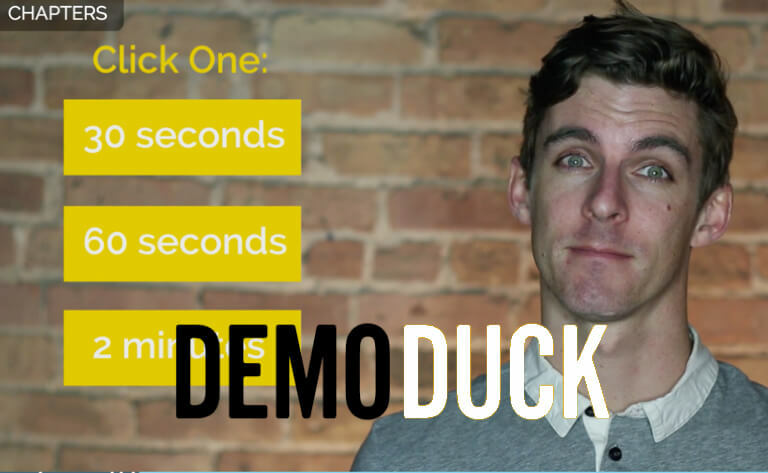 This is a guest post from Colin Hogan, Marketing Manager at Demo Duck.